In October 2010 Accenture published a useful new guide to social CRM summarising the transformation required in organisations by the advent of Social CRM. 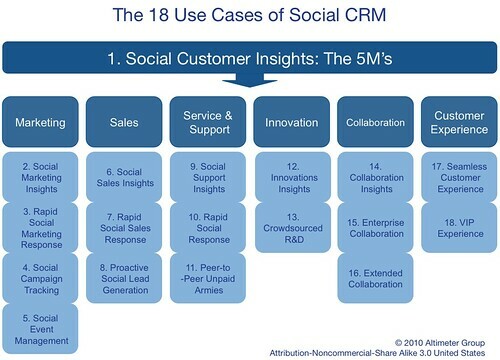 This is useful addition to the framework of 18 CRM processes of Social CRM covered in the Altimeter Social CRM report from earlier in 2010 covered later in this briefing. We think Social CRM and Social Business are still useful concepts to explain the changes to a business needed for the transformation to make full use of social media - the 18 Use cases of Social CRM for example really shows the scope of social media is much more than posting updates on social networks. This seems to be the situation c2000. 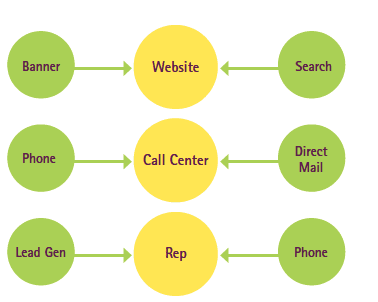 Here a combination of outbound and inbound marketing occurs through a relatively number of channels. Today, the choice of service channels is so much wider, meaning companies must seek to deliver online customer service through Email, Facebook, Twitter and You Tube as explained in our post on online customer service best practice. We've talked about how every organisation has to introduce publishing processes to produce the exceptional quality content needed for inbound marketing. 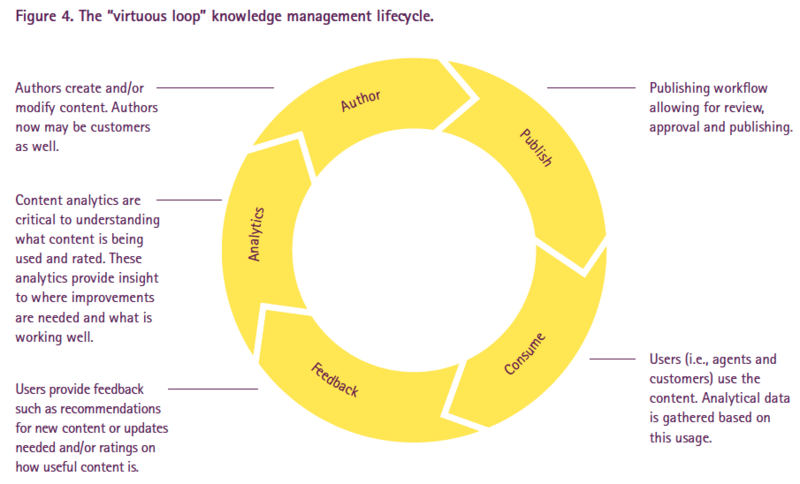 Likewise Social CRM requires a new customer service process integrated with this publishing process shown in the Accenture report. Social CRM has been around as a concept for a couple of years now, but this is the best report I have seen which has a definition and outlines the strategy issues which need management. The report is written by Jeremiah Owyang, ex Forrester Research, but now an analyst at the Altimeter Group. You can download it via the Slideshare embed at the end of my review. 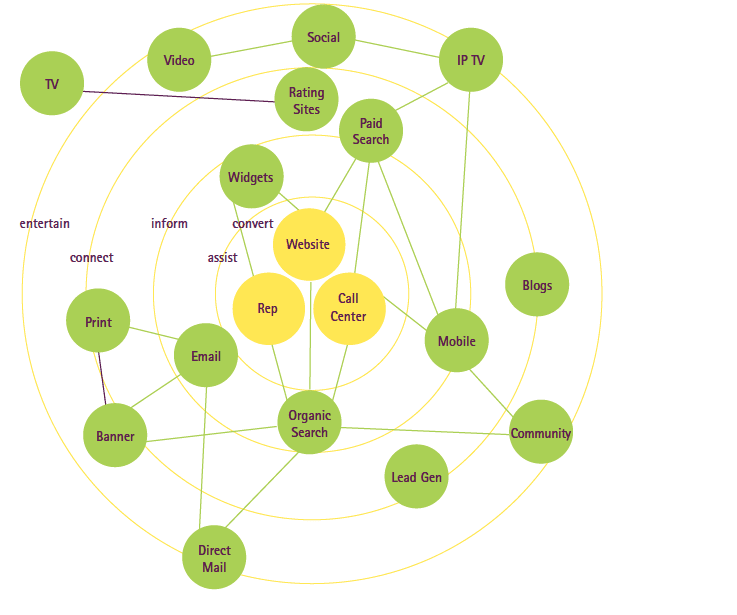 The report doesn't define social CRM, instead seeking to show the scope of how it can apply in organisations through this diagram, which is a very useful framework, both for defining social CRM and defining a strategy. existing customers and prospects with a brand and so enhance CRM. In the definition I have deliberately avoided using the term "social networks" since conservations can occur across a range of site types, including Facebook and Twitter, but also a companies own blog, third-part blogs, reviews-and-ratings sites or in neutral web self-service forums like Get Satisfaction. 1. Marketing. Monitoring, analysis and response of customer conversations through social listening tools. I think the report misses a discussion on integration of social marketing into other campaign tactics like email marketing. 2. Sales. Understanding where prospects are discussing selection of products and services offered by you and competitors and determining the best way to get involved in the conversation to influence sales and generate leads. Within B2B, Linked-In is an obvious location that should be monitored. 3. Service and support. Customer self-help through forums provided by you and neutral sites. 4. Innovation. Using conversations to foster new product development or enhance online offerings is one of the most exciting forms of social CRM for me. I have written about the many software tools to encourage customer feedback. 5. Collaboration. This is ebusiness collaboration within an organisation through an intranet and other software tools to encourage all forms of collaboration which support business process. 6. Customer experience. This references the use of social CRM to enhance the customer experience and add value to a brand which is implied by many of the other aspects above. It gives the examples of using VIP programmes offering collaboration between customers with shared characteristics to add value and create advocacy. A social CRM strategy can be developed by reviewing and prioritising options in each of the 6 business applications above. The report has a useful chart to assist prioritisation - it shows which applications are most popular; currently the social listening tools. 1. Monitoring. Reviewing the method of social listening and deriving insights from these. 2. Mapping. Finding relationships between an individual customer or grouped segments using different social platforms, e.g. Facebook and Twitter or email marketing. 3. Management. Processes for implementing and reviewing strategy. More detail on campaign management would be helpful here. 4. Middleware. The software tools and APIs used to monitor and gather insight. 5. Measurement. The measures used to assess social marketing effectiveness and ROI.